What a year! When I look back at photos from the beginning of 2015, it is hard to believe I was still pregnant and waiting to meet my sweet baby girl! My boys have grown by leaps and bounds, and my husband has worked hard and achieved a long sought after goal. I have learned and changed a lot this year, too, and am so grateful for all the experiences and opportunities that I have been blessed with. 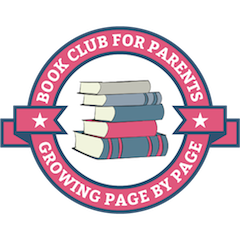 As for this blog: it has been my outlet, my creative space, and my place to connect with like-minded parents. I see Moments A Day as a platform to share what I am most passionate about and I am so thankful that you have decided to follow along. I just took a peak at my Google Analytics and saw that over the past 12 months my blog has seen nearly 1.1 million pageviews with 700,000+ unique visitors. I’m so honoured to have any and all guests in my little corner of the blogosphere, and really hope everyone who stopped by was able to take something positive away! Having my grateful list recreated by others in many different formats and go viral numerous times on Facebook, though it was sadly not often credited to me. I worked on learning the lesson of detachment to any rewards for my work, and also developing a great deal of gratitude to reach so many people with a positive message. 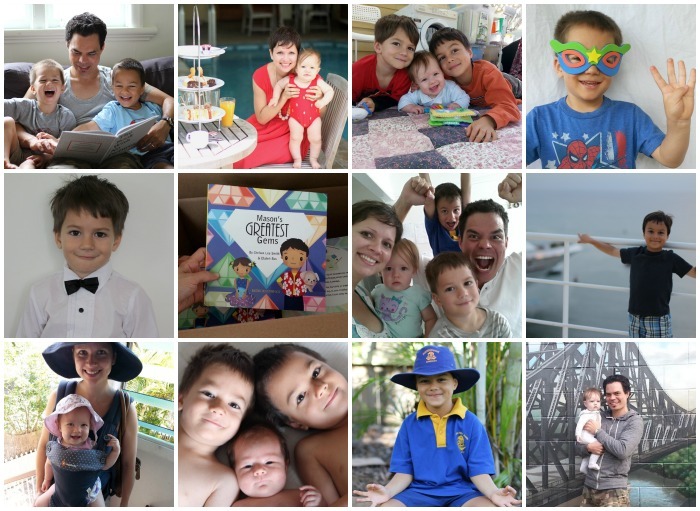 Writing 50+ parenting posts ranging in topics from mindful colouring and teaching positive character traits to being selective with language we use with girls and baby massage. Spending countless hours chatting with, collaborating, and working alongside my favourite bloggy buddies… these ladies are my treasured friends and I learn so much from them both personally and professionally! Thank you to all my readers for reading, commenting, and sharing my posts with your friends and communities. I wouldn’t be able to spend so much time here on the blog without your continued support – so this is “thank you” from the bottom of my heart!! I definitely want to continue blogging because it keeps me accountable. It encourages me to reflect on how I parent, and grow as an individual. I value the feedback I get from readers and really enjoy the creative process (and hard work!) involved in being a blogger. However I also need to be realistic about how much I can accomplish while being a full-time mother and educator of my kids. So this year I will be taking a step back and doing a bit less in the online space. I will likely be blogging two or three times a fortnight (instead of two or three times a week), but will still be sharing regularly on social media so be sure to follow me on Facebook, Instagram or Pinterest if you would like more updates. I enjoy finding and sharing new activities and resources to help our family members build character, because this is one of my top priorities as a mother. This was also the original purpose for my website when I started my blog nearly 2.5 years ago. This year I will putting a lot of my focus into the activity section of my website which you can browse here: Character for Kids. I get inspired reading about families serving their communities, and love being encouraged to do acts of kindness with my kids. I also believe in the power of the internet to do great things, and I want to utilise this wonderful community for some creative service projects! More details on how I plan to keep the Paying it Forward section of my blog alive below. As we travel around Australia, I will be visiting schools to read and offer a presentation on my recently published co-authored storybook Mason’s Greatest Gems. I will be posting updates and related character building activities as we go along. Thanks to Child.com.au for sponsoring these school visits! I look forward to sharing some of their awesome educational resources that can be used for character building throughout the year. I am also very excited to have a guest contributor to the blog this year. The co-author and illustrator of Mason’s Greatest Gems, Elaheh Bos from Plant Love Grow, will be sharing her wisdom and printable activities once a month. If you like creative activities that inspire meaningful conversations with your kids, you will love her posts. My ecourse Lemonade Life Lessons will be launching in February 2016 and I look forward to following a journey towards self-growth and positive thinking with the participants there. I’m also going to continue my ONE THING WEDNESDAY series, which is a weekly prompt that inspires you to work on your parenting skills (by choosing just one action per week!). I am changing the format a bit, and I will update this post with details in January. I have several collaborations in the works for service projects in 2016 which will invite readers to participate in giving to others while utilising the amazing power of the internet. Keep an eye on my newsletter for details. I am also open to continuing my Acts of Kindness by Real Families series featuring stories about families serving together if contributors contact me with their stories. So if you have a past experience you would like featured, please get in touch! I’m fairly certain I will chime in every now and then on some subjects that are relevant to our family as the year progresses but, in general, I will be blogging less about parenting over the coming months. Occasionally I will share lessons learned during our travel and highlights from our trip (there will be a record of what we have been up to on this page). I love to share the awesome resources I find that help families connect, build character and make a difference. Reviewing specific items will be a bit trickier this year simply due to logistics as we are traveling, but I’m sure I’ll run across at least a few favourite products to share… if not on the blog, then at least on Instagram. Don’t forget to check out the reviews already published on this page if you are looking for resources as there are a lot of recommendations there already. I may also have one or two personal projects in the works to contribute to this category too (wink, wink). I also have a few new series of posts drafted up, but will have to see how I go for time as to whether these actually make it into published form any time soon. This year I’m setting very simple and achievable blog goals as my number one priority will be spending time with my family and guiding my kids with their own learning goals on our trip. Plus I’ll have a toddler, so I might just be sleeping every spare moment I can! I hope you will enjoy what I have planned for the year. Definitely sign up for my newsletter if you want to stay updated. I will be sending two newsletters each month this year: one focused on kids activities and the other on parenting tips. I’m excited about making my newsletters even greater sources of inspiration! Please contact me if you have any feedback, questions, or anything else you would like to share. I really value your comments and messages, so thank you for taking the time to connect because it really does make a difference. When I hear from readers, it totally makes my day! My friends at BucketFillers101.com are offering an awesome giveaway pack of some of their very best books worth US$49.95 (plus worldwide shipping included). 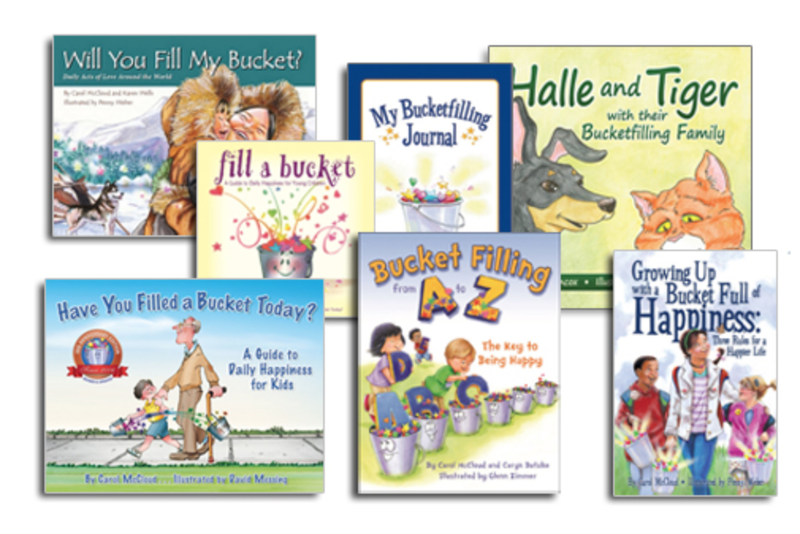 I am a huge fan of the Bucket Filler resources – you can see some of my past reviews and activities by clicking here. The books are great for the home as well as the classroom, and this particular pack of books suits a wide range of ages so there’s something for everyone. You can find links to individual book descriptions on this page. What is one of the best parenting tips you have ever read, heard, or learned yourself? Simple or profound, all tips are welcome! Competition closes midnight 31 December 2015. Entries are open worldwide. Winner will be chosen and contacted on 1 January 2016, and the prize will be mailed shortly after. The most interesting, creative or moving entry will win. See full terms and conditions below. I am wishing you and your family a fabulous end of 2015 and a wonderful start to 2016! Thanks again for being here and supporting me at MomentsADay.com, it means the world to me and I look forward to “seeing” you again in the new year. You must be 18 + years of age to enter. You must provide a valid email address. Entries are limited to one per household. Winners will be contacted by email and announced on this post. The winner must make contact within 5 days of being notified or the prize will be given to the runner-up. The winner agrees to have their contact details passed on to the giveaway organiser in order to be mailed their prize. Trust your instincts. Truly you know your child better than anyone. When I would vent about how difficult the daily grind has been to parent my young daughters, my mom (who lived for her children and four grandchildren – and died unexpectedly in January) would say “just remember…small kids, small problems; big kids, big problems”. It was always a good wake up call to provide pespective that it’s not really that big of a deal. Her words of wisdom will live on! Keep your word, sometimes it’s hard when disciplining, but you must follow through. Read to them everyday. Give them at least one big bear hug everyday. Play. Play. Play. And, there is no better gift than the gift of your time. Put down your phone ! I think the best advice is to cherish each moment because they do grow so fast! To let my kids be… give them time and space to calm down by themselves and then offer a hug. Start with yourself. You can’t change anybody but yourself! When things get tense and you feel like raising your voice to be heard, whisper instead! This one act helps me to respond with love and kindness instead of joining the battle. It also helps to calm the children as they mirror patience and softness instead of escalating their emotions by matching their impatience and frustration. Hm… That’s a hard question haha. I’d have to say not to compare your situation to every other parent’s situation. Each family is different and what is best for others is not always what is best for yours. Khalil Gibran’s poem “Of Children” is like the bible for me on parenting. It helps me to be focused on what the goal of my parenting should be. Helps me to be detached and to not try to live through them or make them like me, for they are even better than I could ever imagine being. It is a poem vey much worth reading and Sweet Honey and the Rock turned it into a song also. I parent by the wise words of Glennon Doyle-Melton of Momastery–“Carpe Kairos”. Our days are filled with lots of little moments that aren’t always fun, the “chronos” moments, but we need to seek out (and I’ve learned to create) the “kairos” moments, those moments when we pause and acknowledge our children with awe and gratitude. In the midst of rushing kids to school and activities, changing blow-out diapers, and trying to plan dinner, I pause to live in the “kairos” —kiss, cuddle and admire my three babies and give thanks for them. Mine is “connect before correct – connection before correction” and I try to apply it and foster connection all the time. The best parenting advice is to trust yourself. If it doesn’t feel right, smile politely and move on no matter who gave you the advice because EVERYONE gives at advice. Connection before correction. My goal is to have kids who want to behave and listen not kids who are scared. I (try to) always get down on their level before directing/correcting. I have heard & been given many parenting tips over the last 8 years. But now after having 4 children the parenting tip I live buy (especially during hard moments) is just ‘breathe breathe breathe, have trust & belief in yourself as a Mum as only you yourself truely knows what’s best for your children & family’. It’s important for me to realize that my kids will never be this little again, tomorrow they’ll be just a bit bigger, more knowledgeable, more capable and independent than they were today. Remembering this drives home the need to slow down and appreciate these passing moments as we go through the rythyms of our day. I try to keep in mind the phrase “the days are long but the years are short”. It helps me to remember that though days, and nights, can be trying or downright difficult, actually time slips by so quickly and I have to make an effort to lay those foundations that matter for my children. It’s not possible to appreciate every moment because life isn’t like that and some moments are mundane… but my children will be small for such a short time relatively and they deserve my very best attempts to help them grow into kind, confident, empathetic and happy adults. One I remember most days as it’s a personal challenge to me and it is also one that creates great discussions and other people resonate to when I share it . . . “Give your baby/child the gift of independence”. Whist still being present allow your child to experience life from their perspective, stepping in when they need some assistance, guidance, support but always letting them know that you are there for them and are aware of their experiences/struggles. This also includes allowing them to fail as some of the greatest lessons and the biggest strengths are learn’t though ‘perceived’ failures. Know your child…love and encourage their potential. Remembering that grace is so important. This is not only for me to give to my kids but to myself as well as I parent and try to do the best I can. Best tip was don’t punish your children when you’re very angry, take a minute to cool off first then give out a proper punishment. Treasure every moment, even the hard ones. My late mother-in-law told me it is not possible to love a child too much. It has shaped me into the mother I am today. Enjoy your kids right now. True joy is found in the moment. It’s great advice and so true, but I will be real honest its hard to do in the real world. I want to try harder in 2016 to implement much of the advice I’ve been given. Advice given to me when I was an elementary school teacher is still so applicable with my little ones: they need to know you like (and love) them. I need to stop to have fun moments with my kids, and give them hugs, smile when they are silly, and let my to do list go. They are people, not projects. Being compassionate toward yourself is the most important thing to practice as a mother. We won’t be perfect every day but this will transcend through to our interactions with our kids and also the way the children interact with themselves and treat others. The first step to being compassionate to the self is practicing mindfulness. And having mindfulness can change the whole tone of the house! First offer respect. Respect children as you would wish to be respected yourself. Second, pause and listen, breathe and then react. Thirdly, always tell your children when they did a good job…practise putting the positive into any “challenges” eg you made a great effort pouring that juice, with a little more practise you will get it just right…instead of…you spilt the juice. However, there is one thing much more important than any of the above and that is…put the cell phone away; turn it off. Have fun. Make memories. Treasure the special moments. Don’t be too hard on yourself or too quick to judge others. A child displaying inappropriate attitudes or behaviour does not mean the parent has failed. It’s simply evidence that the job of parenting isn’t ‘finished’ yet; the child and the parents are still on the life-long journey of learning to understand themselves and the world around them. Strive to be your best and guide your children to be their best, but don’t expect perfection from either you or them. “Everything in parenting is not an emergency” This is the best advice my mother gave me. I am not strictly a parent yet as our first baby is about to arrive in around 10 days!! I really enjoy your site though because I teach a kids meditation class and find your ideas on cooperative games work very well. I find a piece of Buddhist advice very helpful – because we believe in past and future lives, it follows that our children arrive in this life bringing all of their previous experiences, tendencies and habits with them, even though they generally can’t recall what happened before. Some of these tendencies are positive, some more challenging. I feel that understanding this helps to relieve the pressure or way parents blame themselves when their children have characteristics or behaviours that surprise or upset them. We are not entirely responsible for the character who arrives – we certainly are responsible for loving, guiding and nurturing them to the best of our ability once they are here, but I really believe they arrive with personalities that they have formed, life after life. Using approaches like those you talk about in your posts are, I believe the best way to nurture the positive tendencies that kids are born with and help to reduce the less helpful ones. Parents who are not beating themselves up all the time are in the best place to achieve this! Be present with those around you. Right here. Right now. Offer yourself to your family when you have the least time. In turn, they will appreciate you. When we rush we neglect others and ourself. When we slow down we feel better, ‘fill their buckets’ and this often results in a ‘shift’ and ultimately more time for what you ‘need’ as well. Think less, do more. Look after yourself, it’s not selfish, you need to feel good to look after and make others feel gooD. Enjoy now. One day you will wake up and realize you have already nursed your baby for the last time, rocked your baby for the last time, changed your last diaper…..did you realize in that moment while you were doing it, that it was the last time you would do it? Be present in the moment & cherish even the smallest, most mundane moments. Hear your children with your heart. Really listen to what they are trying to say. What if people really listened to each other from their heart? Now that I don’t expect and require my daughter to look in my eyes, our communication has improved. Sometimes, because of that, she voluntarily looks in my eyes and lets me into her soul. That never used to happen. Hearing with your heart can be challenging, but it’s the best advice I’ve ever had!! !